Last night I went to bed heartsick after hearing about two people—Christian friends I love—whose loveless marriage is disintegrating and growing more toxic by the minute. Their story is not of a Blessed Alliance that has failed, but of one that never was, which doubly saddens me because they are both believers. The ache was still strong this morning, so that the powerful story of love I heard on NPR’s Weekend Edition nearly gave me emotional whiplash. 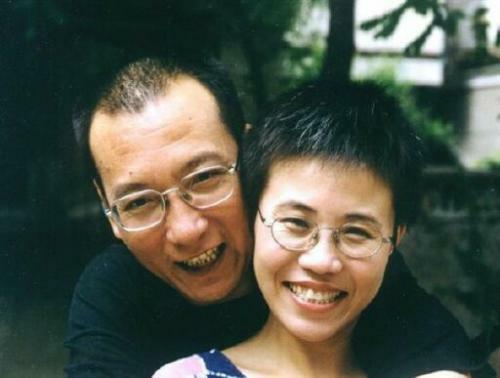 Scott Simon’s report, “Sunlight that Transcends Prison Walls” was a moving portrait of Chinese dissident and writer, Liu Xiaobo, who yesterday was awarded the Nobel Peace Prize. You should read (or listen to) the entire report. Sweetheart … I am sentenced to a visible prison while you are waiting in an invisible one. Your love is sunlight that transcends prison walls and bars, stroking every inch of my skin, warming my cell, letting me maintain my inner calm, magnanimous and bright, so that every minute in prison is full of meaning. Given your love, sweetheart, I look forward to my country being a land of free expression, where … all views will be spread in the sunlight for people to choose without fear. I hope to be the last victim. I am a hard stone in the wilderness, putting up with the pummeling of raging storms, and too cold for anyone to dare touch. But my love is hard, sharp, and can penetrate any obstacles. Even if I am crushed into powder, I will embrace you with the ashes. Perhaps there should be a Nobel Prize for love. Sometimes I think the world is only focused on the next outfit each A List celeb will be sporting. Thanks for reminding us of the real stuff.